Cold and cough are very common in children. If cough is severe, it can lead to difficulties in breathing and other respiratory ailments. If your child is suffering from any kind of respiratory disease I would suggest you the nebulization treatment. Nebulization is used to treat the patients suffering from respiratory diseases like asthma (a chronic disease of airway), continuous wheeze and severe cough etc. It is a process through which liquid medication is vapourized into a fine mist to be inhaled into lungs via a mouth piece or a mask. A nebulizer is used for this purpose which is also known as atomizer. Nebulizer treatment tends to be more effective in delivering aerosolized medications to the respiratory tract. It takes 15 to 20 minutes to complete a standard nebulizer process. This treatment can be used in home and in hospitals with varying capacities to deliver drugs to the lungs. Majority of the people prefer home for this treatment. Nebulization is a good option for your child if he or she has severe cough, continuous wheeze, asthma and chest conjustion problems etc. It helps your child by loosening the mucus in his lungs so he can cough it up more easily. In this way your child also relaxes the airway muscles so that more air can move in and out of the lungs. Lungs medications work best when they are inhaled in the form of fine mist. It is the most effective asthma treatment for infants and toddler. It is the best way that allowss for the correct dose of medication to get where it is needed ; deeply into the lungs. Nebulizer treatment can be taken in one of the three ways based on child’s age. 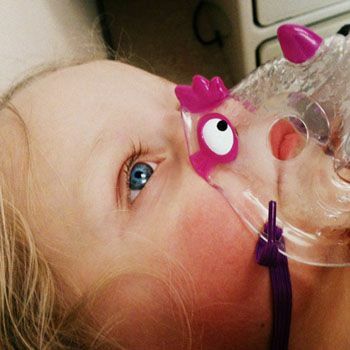 You can use a mouth piece, a mask or blow-by treatment for nebulization. 1. Mouth piece is good for children aged 8 years and older. 2. Mask treatment is used for less than 8 years old children. 3. Bowly-by treatment is good for infants. – You must wash your hands carefully before using a nebulizer to stop the spread of germs. – You should place appropriate amount of medication in the plastic nebulizer cup. – The patient must begin breathing normally and continue until all medication is gone. – If you have a small child you must remain present with him for the entire treatment. – Nebulizer must be clean otherwise, it increases the risk of respiratory infection like pneumonia. – You must wash nebulizer pieces with warm and soapy water and let them air dry on paper towel. – It is important that your child should be relaxed and still for the duration of his treatment. If your child is crying anduncooperative during treatment then nebulizer may be less effective. – If the treatment is shorter than the normal you must check to see if the medicine is leaking out of the nebulizer. Nebulizers are easy to use and provide instant relief to your child. Nebulizers are of different sizes. Mostly small size nebulizers are great for kids not because of their small size but also because of their very fast treatment timings. Physician and patient should consider best methods for the daily use of the needed respiratory drugs to keep symptoms at bay, and to allow the patients to breath easier. China Chow: What’s Better Than Fashion And Chocolate?